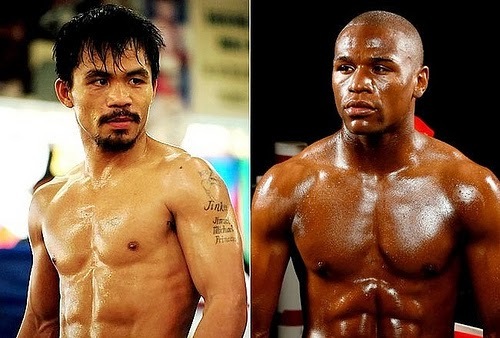 Report: Floyd Mayweather vs. Manny Pacquiao Fight on September 2014 - Balita Boss! In boxing today, undoubtedly, the most-awaited fight will be undefeated American boxer Floyd Mayweather Jr. versus Filipino boxing superstar Manny Pacquiao. With a video report posted on Youtube titled “Manny Pacquiao vs Floyd Mayweather can Happen Sept. 2014,” the dream math will finally take place on September 2014 after several failed attempts, that’s according to 78SportsTV anchor. “Great news in the world of boxing. [He’s a] a good source who’s always getting me good information even when I didn’t believe him, the information turned to be true. He (the source) is telling me that Floyd and Manny Pacquiao will be fighting in 2014 guaranteed and it’s already done,” said 78SportsTV. “Everything else that you see will be theatrics from here on now, that’s what he told me. But the fight is already done,” it added. The source is reportedly the same person who previously leaked the information about the deal between Mayweather vs. Robert Guerero and Saul Alvarez before the bouts were even officially announced. But, Pacaquiao and Mayweather camps have denied the reports. “Don’t believe that story unless Manny or I tell you its true,” Manny Pacquiao’s adviser Michael Koncz told boxing analyst Ronnie Nathanielsz. @abaccordero Koncz told me awhile ago "don't believe that story unless Manny or I tell you its true. "I think no way they can get Arum out. Mayweather also killed the rumors during an interview with FightHype.com. In other reports, Mayweather also said that as long as Pacquiao is currently signed with Top Rank promoter Bob Arum the much-anticipated fight won’t happen. Number one pound-for-pound boxer Mayweather expected to face Britain’s Amir Khan who claims to have signed his contract to fight Floyd. Pacquiao, with his recent victory over Brandon Rios, is said to be choosing between Russian brawler Ruslan Provodnikov and Timothy Bradley.